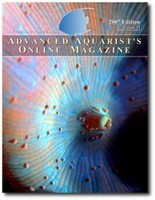 Just as we were the first to introduce a 100% web-based reefkeeping magazine back in 2002 followed by a PDF version in 2007, we continue to innovate by introducing a new way for you to read Advanced Aquarist – in print! 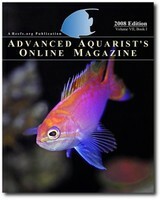 Now you can take a nicely bound 100% color version of Advanced Aquarist with you where ever you go! All of your favorite content in book form! The available editions are 100% color paperbacks measuring 8″ x 10″ in size and come in two separate volumes: the 2007 Edition and the 2008 Edition, Book 1. The 2007 Edition is a compilation of the best articles from 2007 and the 2008 Edition, Book 1 is a complete compilation of the articles from the first six months of 2008. As the Table of Contents for both volumes are pretty lengthy, links to a PDF of each can be found here (2007 Edition, Book 1) and here (2008 Edition). A sample article is also included in each PDF so you can see what a given article will look like before purchasing a book. The layout of the book is almost identical to our PDF Editions, with the exception that it’s been reformatted for an 8″ x 10″ page size. As you may see from the 2007 sample PDF, some paring down of articles in the 2007 Edition was necessary due to our print-on-demand publisher having a maximum page limit of 250 pages for color books. We are very interested in your feedback; if you have any questions or comments, please email us at feedback@advancedaquarist.com. We’d love to hear how we could make the print edition better for you. Send us your likes, dislikes, wants, etc. If you are an author and would like to write for us, please email terry@advancedaquarist.com for article proposals, authoring guidelines, and current article pay rates. If you have an aquarium that you’d like to showcase in our magazine, please email Wade Lehmann at wade@reefs.org. For information about advertising with Advanced Aquarist, please contact Leonard Ho at len@reefs.org. We have a variety of packages that should be suitable for your business needs. We’ve put a lot of time and energy into this project and we hope that you enjoy it!